Future posts on that sister blog will outline some of the rooms, materials and devices in it. From a military point of view though, probably the most useful aspect is the ability to place it on top of a structure 30km tall, and theoretically even 600km tall using the latest strength figures for graphene. Some of what follows will just be place-markers for future posts. From such high altitudes, surveillance capability would be very high. So would the ability to use it to launch gliding vehicles and to house directed energy weapons, and obviously make it easier to attack space-based targets or launch other weaponry and equipment into space. It would therefore be a valuable target for opposing forces and would need protection. Assuming that the military of at least one country have adopted the Carbon Trio as citizens or allies, it is reasonable to assume that the platform would therefore be permitted to house defense-related systems. Lasers are an obvious choice for long-range attack on incoming missiles or planes. Graphene has already been noted for its excellent properties in making lasers, so graphene lasers would certainly be a top priority. Electron pipes would be useful too. Electron pipes are basically linear accelerators that could fire high energy particle beams. I invented them originally as a high-speed upgrade to optical fibre. The original invention dates back to 1991 and is available here: http://www.futurizon.com/wp-content/uploads/2013/05/electronpipejul91.pdf. As a telecomms system, it offers high bandwidth and could certainly be used for high speed comms around the platform to link the high bandwidth devices together. As a weapon system, the Carbon Trio would need to increase the length of the pipes by looping them around their base, increase the voltage by a few zeros, and thus produce a high energy particle beam. The pipes could be nanotubes or graphene tubes, and the coils use graphene wire. A large number of them could be used in parallel to make an intense beam. With the power supply sufficient (I’ll discuss some power generation potential in a later post). The Car-Base would also be able to use mirrors to deflect solar energy. For weapon use, this would mostly come from a space-based array of mirrors. The maximum power level would mainly be limited by international treaties. The sun certainly provides intense enough power to make useful redirection weapons feasible. Graphene dart swarms could also be released from a high altitude platform. These would be very thin and sharp, so could accumulate very high velocity before homing in on their target. These can wipe out an entire force of soldiers, easily penetrating standard issue protective helmets or a vehicle roof. Again, a future post will give more detail. The defence of the Car-Base would not depend solely on weapons. It would also have formidable defences. The structural materials would be extremely strong – carbon fibre would probably be the weakest of them and even that is a good starting point. Graphene, carbon chainmail, nanotubes, carbon foam, cubic carbon and diamond are all pure carbon with very high specs, although a few are still expensive to make, future technology will bring costs down a great deal. The combination of these materials offers a wide range of excellent electrical properties too. Using variable electric and magnetic fields as well as the principles of self organisation, evolution and self assembly, elaborate self healing structures could be assembled and maintained. They could be ruptured in a powerful attack, but could quickly self repair. Some structural components might provide small areas of force fields that could provide some protection but allow ultra-high speed opening and closing of gateways. And of course, the final line of defense would be a squad of combat drones, under Carbo’s command, naturally. Free floating combat drones are familiar in some futuristic computer games – Halo and Mass Effect for example. but have the added value of being feasible. I have spent many hours playing various editions of Mass Effect, from EA Games. It is one of my favorites and has clearly benefited from some highly creative minds. They had to invent a wide range of fictional technology along with technical explanations in the detail for how they are meant to work. Some is just artistic redesign of very common sci-fi ideas, but they have added a huge amount of their own too. Sci-fi and real engineering have always had a strong mutual cross-fertilization. I have lectured sometimes on science fact v sci-fi, to show that what we eventually achieve is sometimes far better than the sci-fi version (Exhibit A – the rubbish voice synthesizers and storage devices use on Star Trek, TOS). 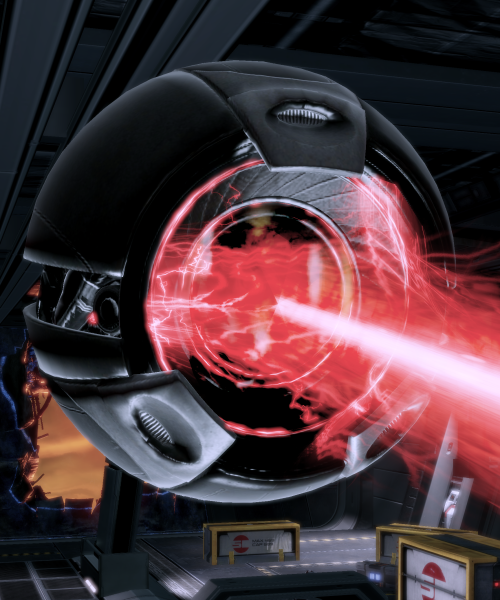 In Mass Effect, lots of floating holographic style orbs float around all over the place for various military or assistant purposes. They aren’t confined to a fixed holographic projection system. 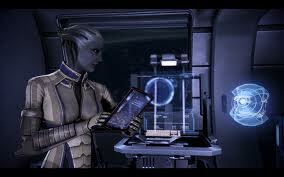 Disruptor and battle drones are common, and a few home/lab/office assistants such as Glyph, who is Liara’s friendly PA, not a battle drone. These aren’t just dumb holograms, they can carry small devices and do stuff. The idea of a floating sphere may have been inspired by Halo’s, but the Mass Effect ones look more holographic and generally nicer. (Think Apple v Microsoft). Battle drones are highly topical now, but current technology uses wings and helicopters. The drones in sci-fi like Mass Effect and Halo are just free-floating ethereal orbs. That’s what I am talking about now. They aren’t in the distant future. They will be here quite soon. I recently updated my post on how to make force field and floating cars or hover-boards. Briefly, they work by creating a thick cushion of magnetically confined plasma under the vehicle that can be used to keep it well off the ground, a bit like a hovercraft without a skirt or fans. Using layers of confined plasma could also be used to make relatively weak force fields. A key claim of the idea is that you can coat a firm surface with a packed array of steerable electron pipes to make the plasma, and a potentially re-configurable and self organizing circuit to produce the confinement field. No moving parts, and the coating would simply produce a lifting or propulsion force according to its area. This is all very easy to imagine for objects with a relatively flat base like cars and hover-boards, but I later realized that the force field bit could be used to suspend additional components, and if they also have a power source, they can add locally to that field. The ability to sense their exact relative positions and instantaneously adjust the local fields to maintain or achieve their desired position so dynamic self-organisation would allow just about any shape and dynamics to be achieved and maintained. So basically, if you break the levitation bit up, each piece could still work fine. I love self organisation, and biomimetics generally. I wrote my first paper on hormonal self-organisation over 20 years ago to show how networks or telephone exchanges could self organise, and have used it in many designs since. With a few pieces generating external air flow, the objects could wander around. Cunning design using multiple components could therefore be used to make orbs that float and wander around too, even with the inspired moving plates that Mass Effect uses for its drones. It could also be very lightweight and translucent, just like Glyph. Regular readers will not be surprised if I recommend some of these components should be made of graphene, because it can be used to make wonderful things. It is light, strong, an excellent electrical and thermal conductor, a perfect platform for electronics, can be used to make super-capacitors and so on. Glyph could use a combination of moving physical plates, and use some to add some holographic projection – to make it look pretty. So, part physical and part hologram then. it could be added into structures to reduce forces needed. So, we’re not looking at orbs that can carry heavy equipment here, but carrying processing, sensing, storage and comms would be easy. Obviously they could therefore include whatever state of the art artificial intelligence has reached, either on-board, distributed, or via the cloud. Beyond that, it is hard to imagine a small orb carrying more than a few hundred grammes. Nevertheless, it could carry enough equipment to make it very useful indeed for very many purposes. These drones could work pretty much anywhere. Space would be tricky but not that tricky, the drones would just have to carry a little fuel. But let’s get right to the point. The primary market for this isn’t the home or lab or office, it is the battlefield. Battle drones are being regulated as I type, but that doesn’t mean they won’t be developed. My generation grew up with the nuclear arms race. Millennials will grow up with the drone arms race. And that if anything is a lot scarier. The battle drones on Mass Effect are fairly easy to kill. Real ones won’t. If these cute little floating drone things are taken out of the office and converted to military uses they could do pretty much all the stuff they do in sci-fi. They could have lots of local energy storage using super-caps, so they could easily carry self-organizing lightweight lasers or electrical shock weaponry too, or carry steerable mirrors to direct beams from remote lasers, and high-definition 3D cameras and other sensing for reconnaissance. The interesting thing here is that self organisation of potentially redundant components would allow a free roaming battle drone that would be highly resistant to attack. You could shoot it for ages with laser or bullets and it would keep coming. Disruption of its fields by electrical weapons would make it collapse temporarily, but it would just get up and reassemble as soon as you stop firing. With its intelligence potentially local cloud based, you could make a small battalion of these that could only be properly killed by totally frazzling them all. They would be potentially lethal individually but almost irresistible as a team. Super-capacitors could be recharged frequently using companion drones to relay power from the rear line. A mist of spare components could make ready replacements for any that are destroyed. Self-orientation and use of free-space optics for comms make wiring and circuit boards redundant, and sub-millimeter chips 100m away would be quite hard to hit. Well I’m scared. If you’re not, I didn’t explain it properly.